In 1539 Spaniard Hernando De Soto launched an expedition (entrada) through the Southeast looking for treasure. The expedition traveled through this area in early April 1540. De Soto led some 600 men and almost 250 horses, an expedition much larger than those of his predecessors, into the unexplored region between the southern Atlantic coast and the lower Mississippi River valley. Although the exact location of DeSoto’s route has been debated for years, some historians believe the explorers visited four principal Creek towns believed to be near the stated locations. The first two were located on the Lower Creek Trading Path: Ichisi, on the east bank of the Ocmulgee River, below present-day Macon, and Altamaha, on the east bank of the Oconee River near present-day Milledgeville. The other two stood near the Upper Creek Trading Path: Acute, in present-day Hancock County, and Cofaqui, located north of this location in present-day Greene County. The Indians provided corn, spring onions, and the meat of deer, dogs, rabbits, and turkeys to the Spaniards. De Soto heard stories of gold and great wealth from the local Native Americans and was convinced that he was going to find a great fortune. 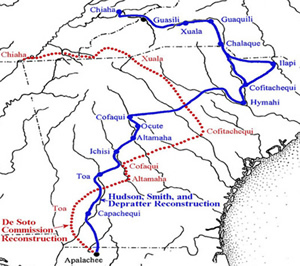 They were advised to travel to the chiefdom of Cofitachequi (located in eastern South Carolina). De Soto was told that great amounts of gold could be found there, but there was no gold. Discouraged, he left the area and traveled westward looking for his fortune. 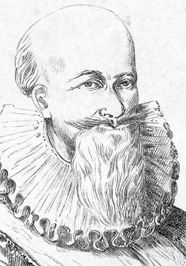 His expedition ended in 1542 with his death, a fate that over 300 of his men shared.